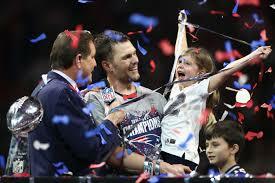 Tom Brady celebrates winning his sixth Super Bowl with his daughter, Vivian, after defeating the Rams 13-3. 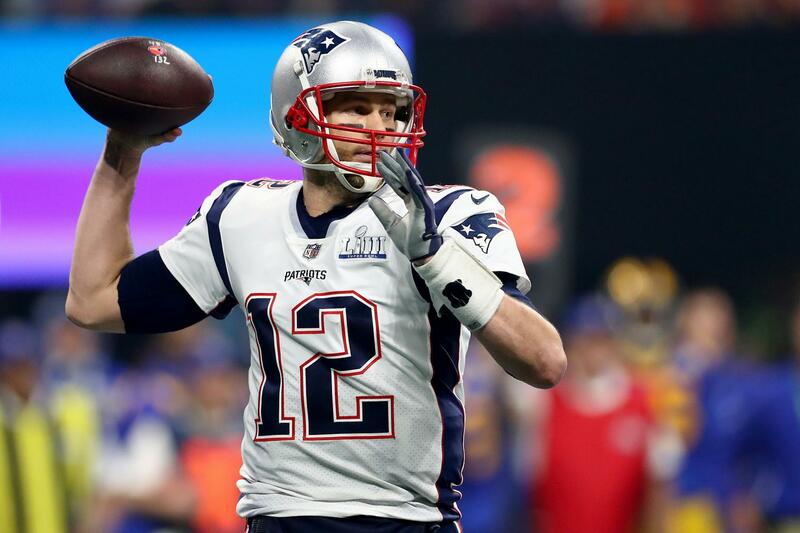 This past Sunday, the New England Patriots defeated the Los Angeles Rams in Super Bowl 53 by a score 13-3. Patriots quarterback Tom Brady won his sixth Super Bowl in what was his ninth appearance in the big game. For perspective, this was the Patriots’ eleventh time in the big game, but Brady’s ninth on his own is more than every other NFL franchise, four of which have never made it since the first Super Bowl in 1967. That statistic alone puts him in the GOAT conversation, but what other arguments seem to validate this point? Since he was drafted 199th overall in the 2000 NFL draft, Brady has led the Pats to an AFC East division title in every season with the exceptions of 2002 when the New York Jets emerged as the top dog and 2008 where Brady missed the entire season due to injury. No other division in the NFL has been so noncompetitive or one-sided, whether it has been due to lack of talent by the three other teams, Jets, Bills, and Dolphins, or sheer dominance on Brady’s part is a different debate. Due to the fact that over his time in the league, none of those three teams have been able to raise the Lombardi trophy shows how Brady and the Pats are one of the greatest dynasties in sports history. Tom Brady makes a throw during Super Bowl 53 against the Rams last Sunday. When he went under center against the Rams during the Super Bowl this weekend, he broke a tie with Charles Haley, who played linebacker for the Dallas Cowboys and San Francisco 49ers in the ‘80s and ‘90s, as the player with most Super Bowl victories. Prior to the game, they both sat at five rings, which was already the most in NFL history. But with the victory over LA, Brady is now in a league of his own with six rings, the same amount of an athlete who is considered the GOAT of another sport, Michael Jordan. All season long, multiple major sports networks had written the Patriots off. ESPN’s Max Kellerman had this to say back in July of 2016, “(Brady) is just about done. He is going to fall off a cliff and be a bum in short order.” On January 14th, Kellerman stood by his comments about Brady after he lead the Patriots to a win over the Los Angeles Chargers in the second round of the playoffs in a dominant 41-28 performance. Since Kellerman made this famous claim, Brady has made it to the Super Bowl in each of the three seasons that have passed, winning two of them. And with his win on Sunday, he has now become the winning-est player in NFL history. I don’t believe “bum” is the right word to describe Brady over the past three seasons, or over his career in general. The man is 41 years old and still among the top quarterbacks in the NFL. Sure, he may not be the same Tom Brady as he was statistically ten years ago, but he still is the same guy who knows how to win football games no matter the stakes. Leading up to the AFC Championship on January 20th, many believed that second-year sensation MVP Patrick Mahomes and the Kansas City Chiefs would end Brady’s reign and advance onto the Super Bowl. People were thinking of all sorts of reasons to doubt Brady, whether it was the snow/cold weather, or playing on the road at Arrowhead Stadium which has been claimed to be one of the hardest places to win in the NFL. None of the haters seemed to phase Brady however, as leading up to the game Brady was said to have walked into the locker room and yell, “I’m the baddest mother****** on the planet.” Well, it’s certainly become hard to disagree with that statement. Being considered too old to be playing each year, then proceeding to dominant in each of the previous three seasons is pretty impressive and is one of the many reasons Brady is considered the GOAT by fans everywhere. 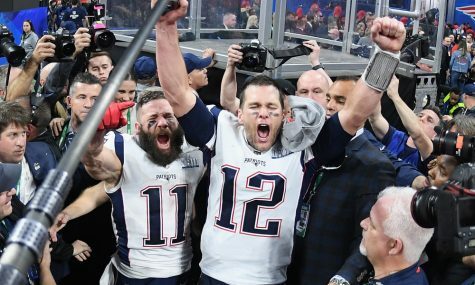 Julian Edelman (left), and Tom Brady (right), celebrate after winning Super Bowl 53. Edelman, who took home MVP honors, now has three titles with Brady. The easiest argument to rank Brady as the GOAT is due to his dominance over the course of his career, and he hasn’t shown a sign of slowing down even at the age of 41. A common argument against Brady being the GOAT is 49ers legend quarterback Joe Montana. Montana went four for four in his super bowls and never threw an interception on the big stage. If you go by statistics just for the Super Bowl, Montana seems to have outplayed Brady when it mattered most. However, Brady will have played in nine, and won six of those. He may have dropped three, but he has made some incredible runs in those games that make him seem unstoppable. For example, two years ago against the Atlanta Falcons, the Patriots trailed 28 to 3 with just eight minutes remaining in the third quarter. A comeback seemed impossible as Atlanta had dominated all aspects of football the entire game. But nothing is impossible for Tom Brady, right? Brady led the Patriots to arguably the greatest comeback in Super Bowl history in which they won 34 to 28 in overtime en route to Brady’s fifth ring. That game alone proves why Tom Brady is the GOAT and with his late touchdown drive last Sunday, Brady has officially capped a game-winning drive in the fourth quarter or overtime in all six of his super bowl wins, just adding to his resume as the greatest and most clutch NFL player of all time.